Pong Dam, set in Kangra valley of Himachal Pradesh, is an example of nature’s magnificence and human ingenuity. It is an embankment dam built on Beas river that is named Maharana Pratap Dam, after the illustrious erstwhile Rajput king from the house of Udaipur in Rajasthan. The reservoir, spanning more than 60 acres in area, has come to house a rich variety of birds and fishes. During the winter migratory season, the wetlands attract thousands of birds, some from as far as Siberia For its rich habitat, especially that of its seasonal winged visitors, more than 15 acres of the wetland has been declared a protected World Ramsar Wetland site. 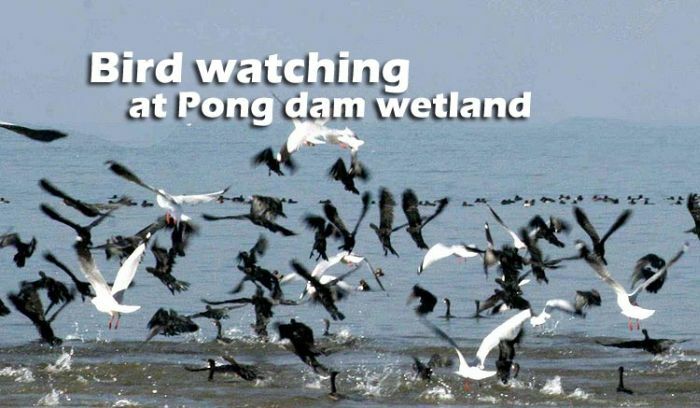 More than 300 species of birds have been spotted at Pong, making it a veritable paradise for bird watchers. The species recorded include the bar headed geese, ruddy shel duck, spot-billed duck, northern lapwig, terns, egrets, waterfowl and many others. A yearly bird census count is conducted and a recent one counted more than 1,30,000 birds in the wetland. Records shows that the number of birds has steadily been increasing every year. The waters of the reservoir contain a variety of fish that are exploited for recreational and commercial purposes. Fish fingerling’s are introduced to the dam waters regularly for topping up the depleting stocks in the reservoir. The wetland is also a favorite spot for mahseer angling. Pong Dam backwaters are encircled by a forest area where rich vegetation abounds. Trees like Shisham, Mulberry, Eucalyptus, Acacia, Mango, several shrubs and climbers grow here. The vegetation provide a verdant cover to the area that make it very inviting for visitors. The man made water body also has facilities for a variety of water sports and other adventure sport activities. A regional water sports center established here has facilities to conduct canoeing, sailing, water skiing and rowing, apart from swimming. The maximum depth of the water in the reservoir goes down to 100 meters and there are safety restrictions in place about permitting visitors to indulge in sporting activities of their liking. Water safety courses are regularly held, where basic learners to advanced courses are conducted under supervision of trained professionals. 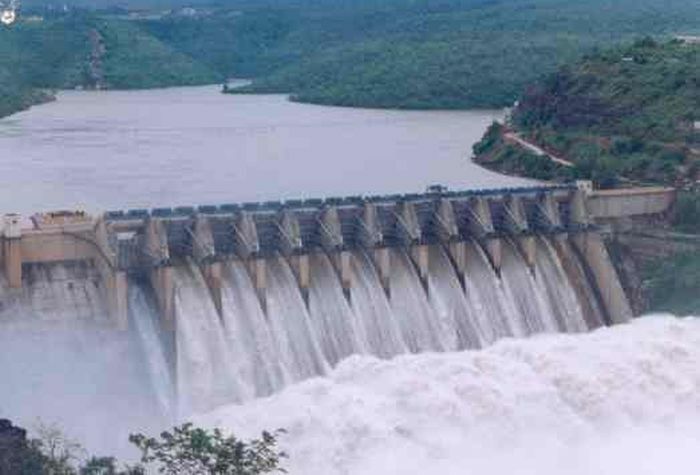 By train Pong Dam can be reached from Pathankot, which is at a distance of 32 kms. Besides a train service, the area is accessible by road. The closest airports are at Pathankot and Gaggal (Kangra), and can also be reached from Chandigarh and Amritsar. There is a 75 bed hostel and a 10 suite rest house for those who choose to stay back for doing water sports courses. 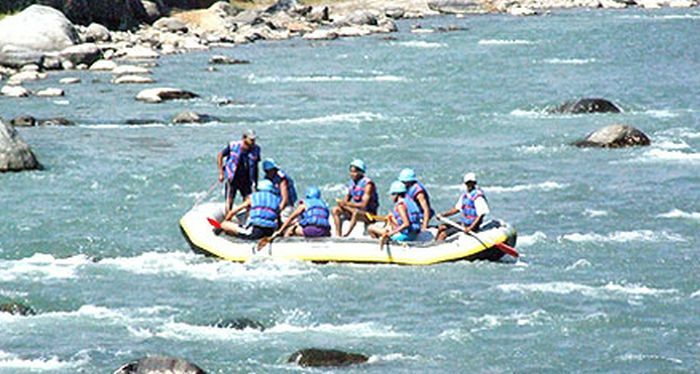 The Atal Bihari Vajpayee Mountaineering and Allied Sports institute, Manali conducts courses in water sports which are very helpful to the uninitiated. The historic Bathu Temples are also close by. These temples were, according to a legend, built by the Pandavas. There are others who say it was a local king who built them. When the Pong Dam was completed in 1974, these temples got submerged as the water filled in. Dramatically, as the water level of the reservoir in the summer months of May-June recedes, these temples in all their majesty slowly emerge from the large water body. The temples turn into an islands that can be approached only by a boat from Dhameta and Nagrota.